Uncertainty, intrigue and fake news have characterised recent days and events in Zimbabwe. Following the confirmation of a bloodless military coup in which President Robert Mugabe has seemingly lost control of the country, the focus has started to shift to the prospect of a post-Mugabe era – and what form this could take. While the idea of regime change has generated excitement after decades of authoritarian rule, the latest developments set a potentially dangerous precedent, and are unlikely to be a panacea to the country’s ills. In fact, if recent examples in Africa are anything to go by, they may even trigger a prolonged period of instability. The lack of precedent around a leadership transition, coupled with Zimbabwe’s weak institutions and fragmented leadership structures, means that the country remains vulnerable to upheaval – amid internal conflict between competing factions of the military and ruling party. The removal of a long-serving leader always generates uncertainty about whether such transitions will be orderly or disorderly, violent or non-violent, and whether they will usher in wholesale change or keep the status quo. Typically, when the military is involved, such transitions are seldom smooth – evidenced by recent examples in both Burkina Faso in 2014 and Egypt in 2011. Both countries have, in recent years, displaced long-serving autocrats via non-constitutional means – and despite initial euphoria, succession processes proved far more volatile and chaotic than initially anticipated. 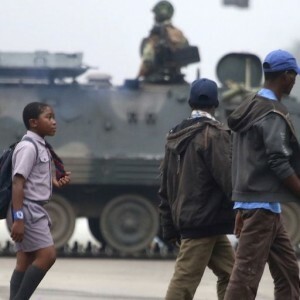 Is this the full extent of the military’s involvement in Zimbabwe’s political space? In Egypt, the country’s first democratically elected government in the post-Hosni Mubarak era lasted little more than a year before being toppled by another military coup. In Burkina Faso, the 2014 ‘insurrection populaire’ which unseated the 27-year regime of Blaise Compaoré was followed by another ‘coup’ attempt by security forces. Although the subsequent popular resistance restored civilian rule, both examples illustrate the complexities involved in managing a change from an autocratic to democratic dispensation in the absence of strong institutions. In many ways, these long-serving tyrants were the glue that held together the warring factions in their countries. Through strongman politics – the combination of political police, divide-and-conquer tactics, patronage and military support – they could suppress dissent and rule by the fear they inspired. The power vacuum left by their demise created grounds fertile for strife. Against this backdrop, we must ask two questions: Will Zimbabwe follow the same path? And is this the full extent of the military’s involvement in the political space? In an optimistic scenario, recent developments would be seen as a ‘good coup’ if they protect against other threats to democracy – before paving the way for fresh elections and a handover to a democratically elected government. Known as a ‘guardian coup’, this is a non-violent intervention whereby the military simply plays a facilitatory rather than a governance role. While possible in theory, in practice such interventions are rarely so linear. A ‘bad coup’ is one where the military plays an increasingly assertive and influential role in the country’s affairs. By setting the precedent of intervention, martial law becomes the norm rather than the exception. In this scenario, generals – each scrambling for their share of the spoils – are focused on self-interest. Consensus remains elusive. Factionalism undermines democratic processes and governance, and raises the possibility of further coups, as was seen in Egypt and Burkina Faso. In Zimbabwe’s case, it is still unclear how the transition will play out. Sober rhetoric from the military leadership has raised hope that it will be the former. It is assumed that the military (given capacity constraints) is more interested in ensuring a successor that safeguards its interests than running the country. But with two distinct blocs in the Zimbabwe African National Union – Patriotic Front (Zanu-PF), each with designs to lead Zimbabwe in a post-Mugabe scenario, the transition may not be so straightforward. Many unresolved questions remain around evolving power dynamics, the role of the military and changes in economic policy. According to the constitution, executive powers must be conferred on the vice president of the country should the president die, resign or become incapacitated. However, with Vice President Phelekezela Mphoko lacking sufficient party backing, and Grace Mugabe now out of the picture, alternatives must be considered. One proposal being put forward is that of a transitional government until fresh elections are held. Here, the diplomatic role of regional bodies like the Southern African Development Community and African Union will be important in developing a road map for a peaceful handover of power and credible elections. However, there are additional complications to consider. On the domestic front, the country needs to first navigate a number of key short-term political hurdles. For starters, Zanu-PF was meant to have a special party elective congress in December. It is unclear whether this will go ahead. Secondly, general elections are scheduled for next year – this also may not happen with the current political situation. For any new leadership, courting the international community must be a priority, given the dire state of Zimbabwe’s economy. Former vice president Emmerson Mnangagwa, now the favourite to assume power, is seen to be pragmatic and reform-oriented. A more politically palatable government to foreign partners could pave the way for the lifting of United States sanctions, the resumption of donor aid and re-engagement with global bodies like the International Monetary Fund. Fuelled by positive sentiment, this could unlock dormant investment and would place the country on a better economic trajectory. However, such a scenario depends on the resolution of the political impasse. Furthermore, the scale and severity of Zimbabwe’s economic malaise means that there is no quick fix to the economy – structural factors cannot be addressed without a comprehensive programme of macroeconomic reform. But again, expectations must be tempered in this regard – any such change would be incremental rather than wholesale, and would need to strike a delicate balance between various factions of Zanu-PF – each with different ideological leanings and economic agendas. Zimbabwe is at a crossroads. Although regime change may yet yield positive results, the exact manner in which this is achieved is important and will set the tone for what comes next. At this stage, it seems unlikely that the country will spiral into a cycle of anarchy, but it is equally unlikely that a fairy-tale transition will occur. Chances are rather that the transition will end up being something in between.